I have been looking forward to getting rid of my local monopoly phone carrier, their "spirit of service" just overwhelms me. I have been following the experiences shared by others with Vonage, it seems that they are the only VoIP carrier that it might work with. Anyone used either of these with the Tivo? The PAP2 is really just a Sipura SPA-2000 in a different package, so anyone use one of those with a Tivo? I wish to know the same thing! I have a PAP2 right in front of me... but Vonage wont let me activate it till friday. Its a nifty little box though. My problem is, that I hear some guys on here have got the Motorola to work with the latest firmware... but I like the idea of having the latest adaptor (linksys) from Vonage. One thing I've been hearing about the PAP2 and the RT31P2 is that they have noisy analog voice ports compared with the Moto's. Would like your input especially with once you've hung up a call whether the dialtone is noisy or not. I'm not sure... but it shouldn't matter if the dial tone is noisy correct? Isn't the dial tone artificial? Thats my question. A number of people have ditched the Linksys because of this and gone back to the Motos so I wanted to see if this noise (noticed on the simul-ring) bleeds into the regular conversation. I have Vonage, and a DirecTV Tivo (Samsung SIR-S4040R). Getting it to work with Vonage is a pain (you have to use a ",#034" prefix to slow the box down to work over the Vonage line). I don't think I can use the DirecTV Tivo box with a wireless network because I heard that these boxes have had their USB ports deactivated. I'd say I connect about 60% of the time with Vonage, which I guess is good enough for the updates. Just make sure you use the prefix to slow the transmission down. I WISH I could get my new series 2 up to 60% connection rate; right now it is 0%. My two series 1 DTiVos both connect 95% or better using the ,#019 slow down code. Vonage is great but it seems quite hard to get it to work correctly with series 2 DTiVos. There are many, many threads about this on this board and it seems to vary form " Mine connects all the time without any special codes or mods" to "Mine connects often but I have to use some kind of code or mod" to mike never connects no matter what I do." Right now mine seems to be in the third category. Even an external modem from Weaknees has not helped, neither has the VERY helpful people at Vonage. They have changes several settings and, so far, nothing has helped. There is still hope as my series 1s do connect virtually all the time. Well, I bit the bullet a few weeks back and switched to Vonage - knowing that I'd have to deal with the nagging from our DTivos in a month or so. Strange thing is, both of our units - a Sony T-60 (no, not hacked), and a DVR2 both are able to call in over Vonage. Both have called the Tivo mother ship, and the Directv servers. Both are successful at it - and I haven't made one change as far as dialing codes. I have the moto box from Vonage - and use Comcast HSI to connect to the internet. I did notice that if I set my QOS on the vonage web site to the medium quality setting, neither would dial out successfully, but with it set to best quality, all is good. From all my research before jumping on the Vonage bandwagon, I figured my DTivos would just have to live without a phone connection. Don't know if others have had such luck, but I thought I'd share my "positive" story with vonage and our DVRs. After reading many times here about problems with DirecTivo and Vonage, I just tried to dial out on my new Tivo and it works. The best thing of all is that I didn't have to enter any slow down code. I am using the Cisco ATA on Vonage. Since I hadn't read anything about the Linksys hardware (too new, I guess) I decided to just go ahead and buy the Motorola. I purchased it, drove home and plugged it in and registered/activated a new account. I tested that I was able to make outbound calls, I then used a wireless phone jack (RCA) to connect my Tivo from downstairs to the Moto ATA upstairs. I performed a test call and it worked. I then performed a daily call and it completed successfully, this is with no dial codes. I have forceed multiple 'daily' calls, all showing as completed succesfully. I have yet to perform any tests with the other 'bandwith saver' options, it is on the default/high setting. Good by to Qwest's "spirit of service" fees. To think I was paying the same price for just dial tone and call waiting, now I get all the features and long distance included for no extra cost. Another thumbs up for Vonage via Motorolla. Okay.. guys.. what version of firmware are you running on your motos? Hmmm...so its beginning to sound as if this new V17 of the firmware is the way to go. Just a slight addition, I am able to make daily calls to my local number (worked again today) and test calls, but I can't connect to the number to retrieve the list of dial-in numbers. It fails during the "negotiating" portion. This doesn't matter to me, but I thought I would share the info. I have also tested the 'bandwidth saver' and have found that it will only connect successfully at the highest (90Kbps). At the lower settings it continually failed to connect, however the 'daily calls' and 'test calls' all pass via the highest setting. None of the forced calls have failed. I have attempted multiple times with the process to get a new call in number, the first 3-4 times it failed. The number it dials is 18772823740, on the 5th try it passed and gave me the list to select from. I decided to leave good enough alone and not switch numbers, since I do have 100% success rate to the local number that I've been using. I willl add that this is on a Comcast cable modem, its rated at 3Mbps/256Kbps. I originally had the ATA 'outside' of my network (between router and cable modem) for initial testing, I since have moved the box behind the router (Linksys WRT54GS) with no changes to the firewall settings (no port forwarding, blocking anonymous and NAT redirect)...it works for in and out-bound calls. Hopefully my luck will continue after my number is fully transferred and I cancel my landline. Good to know. I just bought the Linksys... and am waiting to try it. If it doesnt work, I will be switching to the motorola. Let me know how it works out, I read about someone sending multiplle large faxes over their Linksys PAP2 with no dial codes and they all worked...so it might not be an issue at all. Ok... so I broke down and have set up the motorola... after much effort I got my HD Tivo activated.... Still need to see if it can complete are regular call. I have made a few changes here and just wanted to share the info in the event it would help someon else. I ran into a few issues recently, which are now resolved. I found that if I had the bandwidth saver option in Vonage set to 90Kbps I was unable to consistently access DMTF tone (touch tone) controlled systetms (bank accounts, cellular voicemail, ,work voicemail, etc). If I operate at 50Kbps the tones work fine, the 90Kbps must be dropping portions of the tone due to packet loss or something of the sort. I consider this problem resolved, as so far I have not noticed a significant decrease in sound quality. So far this has worked for daily calls and test calls. I hope this helps someone. Good. But I would hope that people are not relying 100% on Vonage for everything. As long as the HDVR2 can call both Tivo and DirecTv reliably , I could always use a cell phone to access voicemail and touch tone banking etc. since a cell phone can be used for that, but not for the HDVR2. Plus the cell phone is another way to dial 911 or other calls in case of cable or power outage. Are the Vonage systems and accounts refundable? I might pick one up at Best Buy and try to see if it will work with my HDVR2 and if it doesn't work, I'd like to be able to get a refund and cacel the account. You can return the equipment at Best Buy for a refund. I imagine you still have to pay for the service. In my situation, the Motorola worked.. just not on all the numbers. I had to keep on trying local numbers untill one worked... so it took me almost an hour to set up. I have multiple cell phones, so its not a big deal of my Vonage is offline. It is easy enough to power my gear if I need to when the lights are out, but I do not know if Comcast has UPS coverage for all of their network gear. How many people have only cordless phones? They are already livinig with the power constraints. A cheap power inverter and a 12V deep cycle battery will power my gear for a pretty long time if it comes down to it. If you want to give it a try, your best best is probably to go to BestBuy (or other retailer) and pickup a Vonage starter kit. I am pretty sure they have a trial period. If you think you are going to subscribe, PM me with your email address. If I send you a referral and you decide to keep Vonage you will get a month of credit after 3 months of service. Oh, BestBuy also falsly claims in some locations that the price of the Vonage hardware includes 1-month of serrvice (as they do on the Reward Zone site), this is not true. You may be able to leverage that if you want to argue. One problem I still see is that the cablemodem is in the master bedroom, but the two HDVR2s I have are in the livingroom (using IR/RF remote extender) and in a second bedroom down the hall. Can the HDVR2 dial though a wireless phonejack to Vonage in another room connected through a Microsoft router? Can the Vonage connection be patched through the existing phonejacks so it could work without wireless phone jacks? Yes, the Tivo should be able to connect via a wireless phone jack. I tested this using the RCA RC926, a set I had laying in a box that I had no idea what I'd ever use them for. They worked flawlessly. You can also connect Tivo to existing home wiring...HOWEVER, you MUST not connect it to any wiring that is in use by an existinig phone line. The 48VDC from the phone company will fry the ATA. The way I bypassed this is that my jacks are all wired for 2 lines (most are) and used a group of line splitters similar to this: , I connected the ATA to Line 2 and each item I want to use Vonage to a Line 2 on another jack. You may also use Line 1, but *ONLY* after you disconnect your 'normal' phone line. Be sure to test the jack before ever plugging the ATA into it, you can test it with a phone to see if it gets dialtone...if it does, do not connect it. Ultimately you can also check with a voltage meter (DC power) to confirm it is 0-volts. Of course this is all done at your own risk, but I know of many people that have done so with no problems. Each jack in my house has the monopoly phone company (qwest) on line 1 and Vonage on line 2...until my # transfer goes through. Please do not confuse a Line splitter with a standard "Y-jack". A Line splitter modifes which pair of wires the phone connects to, while a Y-jack allows more than 1 phone/device to connect to the same line/jack. On a line splitter Line 1 connects to the 2-center wires on the primary jack, Line 2 uses the Outside pair. A Y-jack, both sets of connects use the center-2 Line 1 wires. 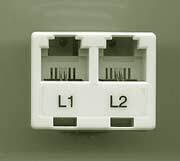 The L1+L2 port passes lines on through as 'normal' or a Y-jack would...so if you plug in a phone it will use Line1. I hope I haven't ovelry confused you. Again, be sure to test any jack/line before connecting an ATA. I think I'd just use the wireless jacks since I think I can close my telco account and still keep the phone line live for free 911 service. Or, it looks I could use the splitter and put tape over the line 1 port so the ATA, phones or Tivos are not accidently plugged into the wrong ports. By the way, does anyone know if Vonage will also work with Dish Network's DVRs? What is the most picky about phone line quality, modem speeds etc.? An HDVR2 or a PVR508?